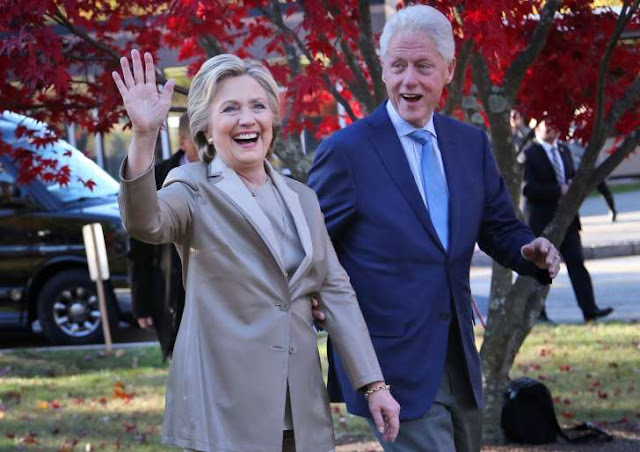 © AP Photo/Seth Wenig, File FILE - In this Nov. 8, 2016 file photo, Hillary Clinton and her husband, former President Bill Clinton, greet supporters after voting in Chappaqua, N.Y.
WASHINGTON — The inauguration of the next president won't play out quite the way they had envisioned. But Bill and Hillary Clinton will still attend inaugural ceremonies for President-elect Donald Trump at the Capitol on Jan. 20, aides for both Clintons confirmed Tuesday. Protocol dictates that former presidents, and their spouses, are given prominent seats to witness an inauguration. But never has a former first lady lost the election, and it had not been a given that either Clinton would attend. Hillary Clinton's attendance, in particular, will be an important symbol about the peaceful transfer of power in America despite one of the most bitter campaigns in recent memory. Both Clintons spoke with Trump to congratulate him on his victory. A spokesman for former President Clinton said they have not spoken since. Mitt Romney, who lost the 2012 election to President Barack Obama, did not attend Obama's second inaugural, opting to spend the day in La Jolla, Calif. He had dropped by the White House weeks before for a post-election lunch with Obama. Previous election losers, including Sens. John McCain, R-Ariz., and John F. Kerry, D-Mass., were on hand for the inaugurations. Al Gore, as the outgoing vice president, also attended George W. Bush's first inaugural in 2001 despite the close election result and recount battle in Florida. Bush, the 43rd president, will also attend Trump's inauguration as the 45th, as will former President Jimmy Carter. Former President George H. W. Bush will not attend because of health issues, CNN reported . Two months after her election loss, Hillary Clinton plans to be in the crowd for the Jan. 20 inauguration of President-elect Donald Trump. An aide to the Democratic nominee confirmed Tuesday that she and former president Bill Clinton will attend this month's ceremony, speaking on condition of anonymity until plans are announced publicly. It will be the first joint public appearance by Trump and Hillary Clinton since the three presidential debates that preceded Trump's surprise election victory. Bill Clinton will be one at least three ex-presidents at the Jan. 20 inauguration of Trump; George W. Bush and Jimmy Carter have also announced plans to attend. Bush and former first lady Laura Bush "are pleased to be able to witness the peaceful transfer of power — a hallmark of American democracy," spokesman Freddy Ford said Tuesday. Former president George H.W. Bush is not expected to attend because of health reasons. As is tradition, current President Obama will also be at the inauguration of his successor. Hillary and Bill Clinton will attend President-elect Donald Trump’s inauguration later this month, aides to both politicians told CNN on Tuesday, January 3. Former president George W. Bush and former first lady Laura Bush will also attend the Friday, January 20, ceremony in Washington, D.C., the Texan’s office told CNN in a statement. "President and Mrs. George W. Bush will attend the 58th Presidential Inauguration Ceremony on January 20, 2017, at the U.S. Capitol in Washington, D.C.," the statement read. "They are pleased to be able to witness the peaceful transfer of power — a hallmark of American democracy — and swearing-in of President Trump and Vice President [Mike] Pence." As previously reported, [George] Bush, 70, did not vote for fellow Republican Trump, 70, in this year’s election. Trump said it was “sad” that he did not vote for the ex-Celebrity Apprentice host. Throughout the Republican primaries, Bush and his father, 41st POTUS George H. W. Bush, supported their family member Jeb Bush, who was considered an early front-runner but was crushed by Trump in the primaries. The elder [George] Bush, 92, will not be attending the real estate tycoon’s inauguration due to health reasons, a spokesman told CNN. Prior to Election Day, only former president Jimmy Carter — who served as commander in chief from 1977 to 1981 — said that he would come out to support Trump on Inauguration Day. It is customary for multiple former presidents to attend the event every four years, regardless of party affiliation. Despite the results of this year’s election, former Democratic presidential candidate Hillary, 69 — who won the popular vote by nearly 3 million votes — has taken her loss to Trump with her head held high. The former New York senator gave an emotional address at a Children’s Defense Fund event in Washington, D.C., on November 16. 0 Response to "Hillary and Bill Clinton will attend Donald Trump's inauguration"